If you’ve spent time and money improving your yard space only to find yourself being forced inside when the sun goes down, it might be time to consider some lighting upgrades. Outdoor lights are hugely popular and relatively inexpensive, offering a way for homeowners to spend more time enjoying their outdoor space without the limitations of daylight. But while installing outdoor lighting is as easy as buying lights and plugging them in (or easier still with solar lights), creating a tasteful and effective lighting setup takes a little more thought. Why do you want lights in the first place? Is it so that you can cook out on the grill and enjoy a meal on the deck with friends and family? Or is it so the kids can play in the yard at dusk without fear of tripping or other hazards? No matter what the purpose of your new outdoor lighting setup, it’s important to know what your reasons for wanting extra light are before you head to the store. Once you’ve nailed down the important parts, it’ll be easier to decide exactly what style of lights will work best for you, and how many you’ll need. It doesn’t have to be an artistic masterpiece, but having a sketch of your yard (including some measurements) can be a huge help when it comes to planning out a lighting setup. It’s important to include existing lights, large objects or buildings (such as sheds or garden containers), and any substantial vegetation (trees, shrubs, etc.). Looking at the big picture will help you figure out exactly what you need. Landscaping. 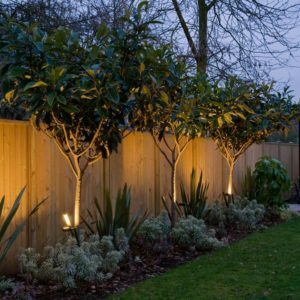 Tasteful lighting of vegetation around the yard can be a great opportunity to make your hard work shine; and lighting a line of trees along a fence, for example, can provide a natural reflector that can illuminate more of your yard with even fewer lights! Decorations. Highlighting yard decorations like fountains and water features with soft lighting can be a major enhancement to their aesthetic appeal. There’s nothing quite like the soft glow of a bubbling fountain on a warm summer night. Pathways. Pathway lighting is important, not just for aesthetics but for safety! 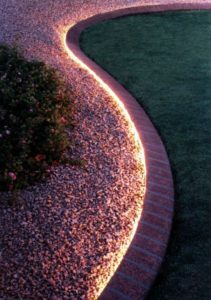 Having a well lit walkway, especially if it’s formed out of imperfect or uneven stone or wood, can make your yard an easier, safer place to enjoy after dark. Once you’ve decided what kind of lights you want, and where, you can start the process of selecting different styles and fixtures. Depending on how much effort you want to expend, you may choose primarily solar lighting (which doesn’t require a lot of extra effort with running and concealing cords) or you might go with a more permanent solution. There are hundreds of options available to you, so once you’ve got the basics down it’ll be easier to pick the best one! This entry was posted on Monday, April 24th, 2017	at 2:55 pm	. Both comments and pings are currently closed. How Much Does It Cost to Build a Pool in Maryland? My wife and I recently purchased a new home and needed a fence. We contacted excel among a few others and had them come out to perform a free estimate of what we were looking for. They were great in helping us decide on what would be best for our needs now and in the future, and really worked with us on our budget as well to keep it as affordable as possible. In getting quotes from some of their competitors, excel came in SIGNIFICANTLY cheaper than the other quotes I received. One of our biggest worries was that we had two dogs and unfortunately we booked too late to have the fence installed prior to our moving in. Excel was great in providing temporary fencing for us so we could still allow our dogs out back without having to worry. On the date of install they arrived exactly as scheduled, first thing in the morning. Everything with the install went great. It took two days to complete, and looks even better than we had hoped. I would happily choose excel again in the future if I ever need anymore work done. The crew was on time, solved a technical problem ( the fence is a few inches from neighbors deck) and had the work complete and the site clean as scheduled. They answered my questions and appear to enjoy building fences. I only wish they had a business cards I could give to neighbors who admired the work. We are very happy with our newly installed fence. We went with a 3 rail vinyl fence and it looks great. It seems very sturdy and looks like it will last for many years to come. The install team was on time, very friendly and professional. Charlie and Lisa were quick to answer emails and phone calls. Charlie went above and beyond to make sure we loved our fence and that we were 100% satisfied. I feel we made an excellent choice by choosing Excel Fencing and would recommend them to anyone.